Jordan Veretout scored a 101st-minute penalty as Fiorentina drew with Inter Milan in late VAR controversy. The referee, after a five-minute delay to watch the incident, stuck with his decision to penalise Danilo D'Ambrosio for a handball, with Veretout netting. Inter had led 3-1 with Matias Vecino, Matteo Politano and Ivan Perisic scoring after Stefan de Vrij's early own goal. 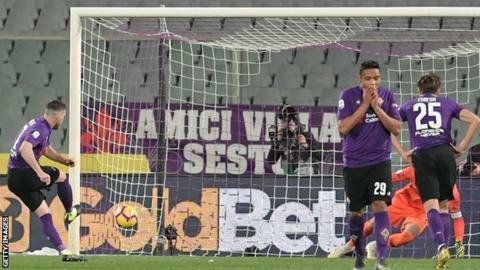 Luis Muriel's free-kick gave Fiorentina hope before the late drama. The late penalty was initially awarded in the closing stages of seven minutes added on, with Fiorentina protesting the ball hit D'Ambrosio's chest. Four minutes later after Rosario Abisso watched the incident again, the penalty was given and Veretout scored just after the 100-minute mark. It was the latest goal in Serie A since Opta started recording that data in 2004-05.